Performance Time: Approximately 45-60 mins, 43 pgs. CHILDREN’S COMEDY. Children of all ages will love this wildly wacky version of the story of Aladdin from The Arabian Nights. Times are tough for Aladdin and his mother. They don’t have enough money to pay their taxes and may lose their home. So when an evil sorcerer convinces Aladdin to retrieve a brass lamp from a cave, Aladdin is eager to earn some extra money. But when the sorcerer dupes Aladdin, Aladdin refuses to hand over the lamp, and the sorcerer rolls a boulder in front of the entrance, trapping Aladdin inside. When Aladdin rubs off the lamp, a genie appears and frees him from the cave and grants him three wishes. Determined to get the lamp back, the sorcerer poses as a lamp vendor and convinces Aladdin’s mother to sell him the lamp. 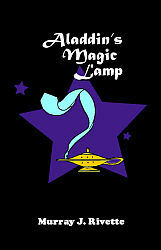 With the lamp in hand, the sorcerer thinks the genie now belongs to him, but the genie has a little surprise for him. She just happens to be a member of the Lamp Union for Genies and it turns out legalese beats out evilese!